Are you a forensic psych expert? The moment a defendant walks into a courtroom, everyone is trying to get in their head to figure out if they actually committed the crime, and what could have driven them to the act. That’s why expert testimony from mental health experts can be critical for juries, especially in high-profile cases. Do you think you know how forensic psychology and psychiatry affected these famous court cases, and have what it takes to prove yourself to be an expert witness? 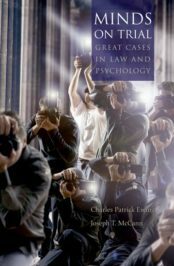 Test yourself with this quiz, informed by Minds on Trial: Great Cases in Law and Psychology. This quiz is also available online here. Stephanie King works on the Psychology Marketing team at Oxford University Press. I don’t understand why an OU site uses a quiz based on US cases and experience, presenting matters unknown in GB.